The objective of this case study was to evaluate whether lower crustal bodies (LCB) imaged along the Norwegian margin could be serpentinized mantle. Many different hypotheses have been formulated for the origin and nature of LCBs along the margin including magmatic underplating, mantle serpentinization, and high-pressure metamorphism. These scenarios imply fundamentally different thermal evolutions and source rock maturity scenarios illustrating the clear need for improved integrated basin models. We adapted TecMod to resolve the metamorphic reaction of dry peridotite to wet serpentinite. For this we track the rheological evolution of the crust and mantle. Once the entire crust has become brittle, seawater is allowed to migrate along dilatant brittle faults to reach and react with cold mantle rocks to make serpentine. The modified TecMod version was then used to reconstruct the Norwegian margin in 2.5D using TecMod’s multi-slice option in order to map out serpentine bodies. We then quantify if and when serpentinization may have occured and if the inner LCBs could be serpentinized mantle. Published as “Interrelation between rifting, faulting, sedimentation, and mantle serpentinization during continental margin formation-including examples from the Norwegian Sea” in Geochemistry Geophysics Geosystems, 2013. 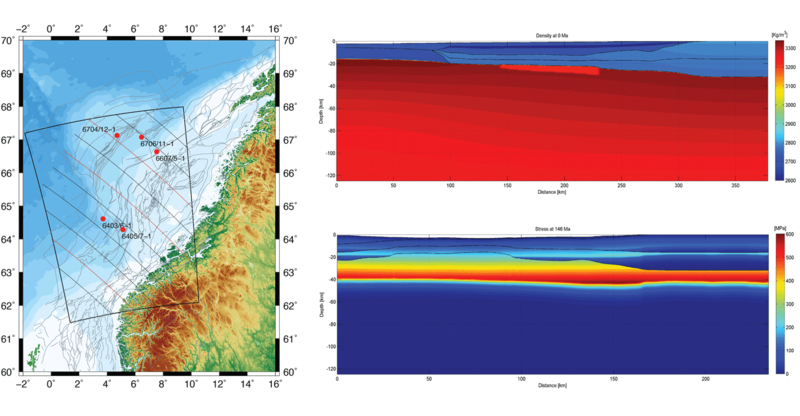 The map shows the study region along with the structural elements of Norwegian margin and the location of the multi-slice transects. Five wells were used for the thermal calibration of the models. Low-density serpentine underplates formed upon crustal embrittlement.